The new year of classes is here! We kicked things off last week with Lindy B and C classes from our wonderful out-of-town teachers Kay and Natalia, who will be teaching here with us on Tuesdays during the coming block of classes for Lindy C and our NEW block of speciality classes. See you there on the dance floor! 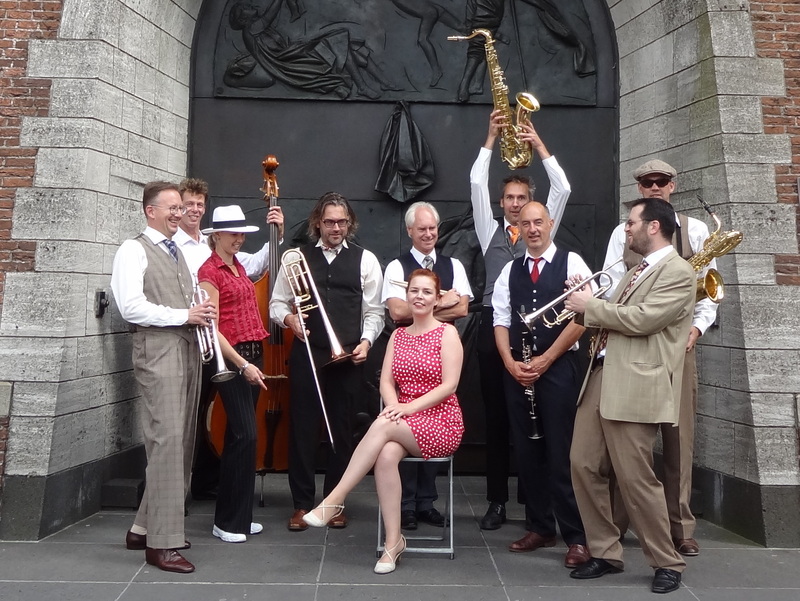 Swing SOS with the Happy Feet Orchestra in Nijmegen! Last night we kicked of the new season of Lindy Hop at Lindy What? here in Nijmegen with a social dance event featuring the Happy Feet Orchestra. Starting with a taster class for beginners with May and Simon, we rolled into a fantastic evening of live music with the Happy Feet Orchestra (check out their promo video clip below). The evening also featured a performance of the Big Apple routine by Tobi’s summer school students! 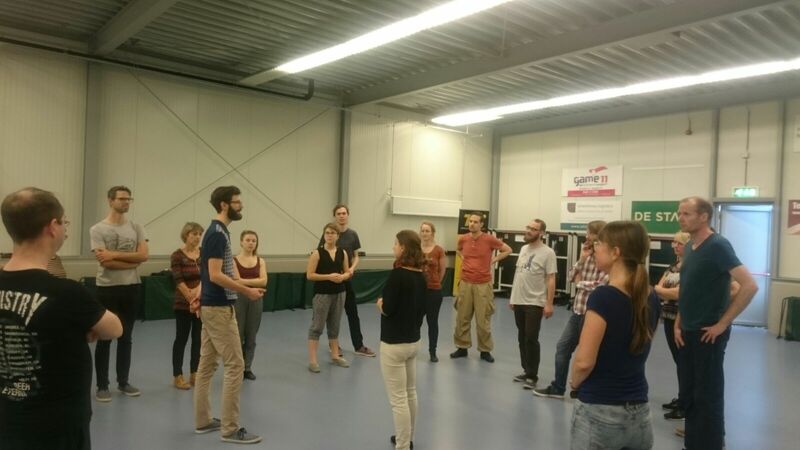 We welcomed Frederique from Eindhoven to give a workshop with Simon, all based upon the theme of Rhythm and Play! We worked on breaking down our Lindy Hop moves into bite-sized chunks and playing around with mixing them up. The final goal was to get everyone to play wth their footwork and body movement to express themselves in time with the music. There was a visible and audible change in everyone’s dancing: well done all for your hard work and marked improvement! Natalia was back with us in Nijmegen! 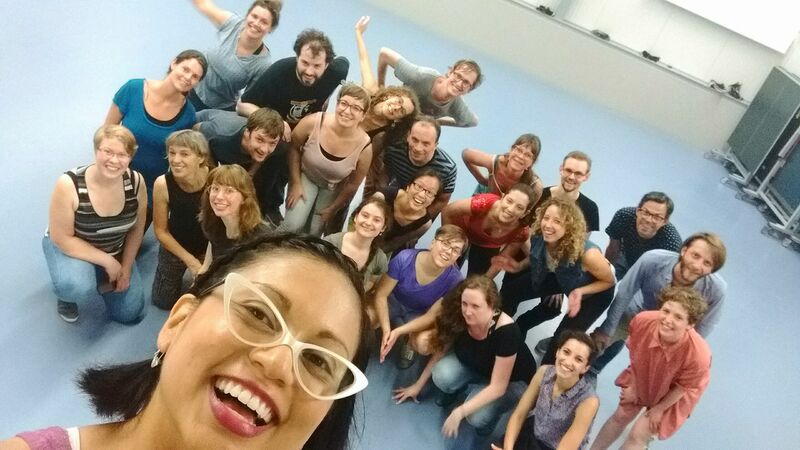 The last block of classes saw the amazing Natalia Rueda come back to Nijmegen to teach a course of solo jazz classes. As well as learning some new steps, we worked very hard with Natalia to practice ideas such as musicality and improvisation. Of course, these ideas flow naturally into improving our Lindy Hop couple dancing. Thanks Natalia, see you again soon! We have been so very lucky to welcome Natalia Rueda (Colombia/Canada) to teach here in our Lindy What? scene in Nijmegen. Natalia is a very experienced dancer/choreographer and competition judge and so it was to be expected that we would love what she did with us. Natalia gave a range of courses, starting with four weeks of authentic solo jazz dancing, where we learned a variety of classic jazz steps and how to put them together into a routine. This happened in parallel to her classes with our Lindy C (intermediate) level. Her residency here in Nijmegen finished with a weekend workshop on August 5th, where we had two tracks of small, intimate groups so that Natalia could give us a great deal of close attention. In the evening was Natalia’s last class with us; we then spent the evening dancing with some birthday jams and a leaving jam for Natalia, after which she embarked upon her European touristic adventure. We would welcome her back very soon! This Tuesday saw the Nijmegen screening of the US documentary “Alive and Kicking” which chronicles the revival of Lindy Hop in recent decades. The makers did a very good job of illustrating the passion and dedication of modern day Lindy Hoppers: it would have been nice to have a better picture of where this all came from. It was nice to see a few clips from Frankie and Norma. We finished with an impromptu social dance outside the venue: everyone had a lot of fun! The weekend of Saturday 18-Sunday 19 March saw our celebration of three years of Lindy What? here in Nijmegen and it was a blast! The weekend ran with three tracks of classes with David and Cátia for dancers of all abilities. We learned a variety of refined techniques (how to have a good, relaxed but clear pendulum of swinging motion) and some new figures which we used to incorporate these new techniques into our dancing. 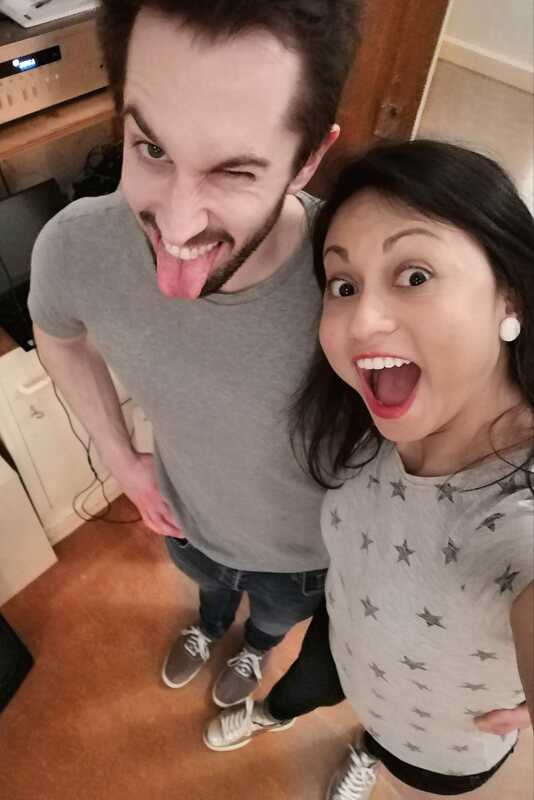 On the Saturday night we had a party with live music courtesy of the Streejtbeat Empire and our first Mix and Match competition, run by our very own Jack and Jill (aka Marcel and Lieneke), which everyone enjoyed. There was an amazing turnout not just by our lovely Nijmeegse dancers but from all over the Netherlands! Thanks everyone for making our birthday party such a success! 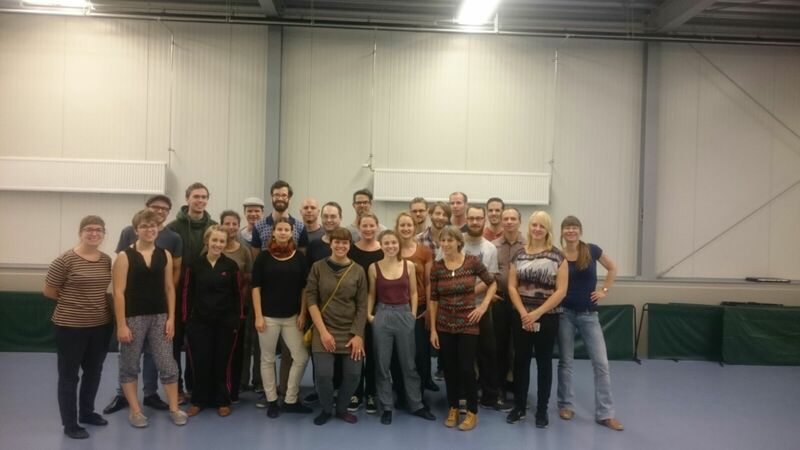 On March 9th We were lucky enough to host some Lindy Hop royalty here in Nijmegen: Lennart Westerlund and eWa Burek. These two Swedes have been and continue to be an integral part of the evolution of the dance. Indeed, Lennart was one of the original Swedish swing dancers who went to New York in the early ’80s to track down some of the “old-timer” Lindy Hoppers such as Al Minns. 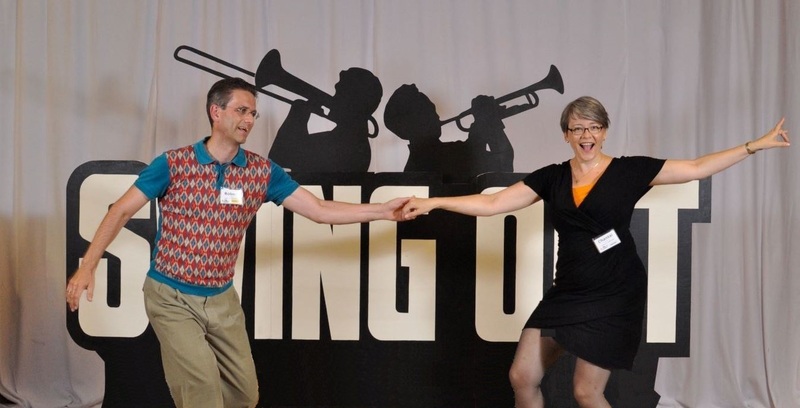 Within a few years, Lennart and eWa were dancing in the Lindy Hop display troupe “the Rhythm Hot Shots” (see our media section for some nice footage). The evening started with a special lecture by Lennart, through which we learned some of the history of Lindy Hop, the people involved and its evolution, most notably including Frankie Manning, Al Minns and Norma Miller. This was followed by a short workshop which involved learning a good sense of rhythm, scatting and body movement. We were ever so happy to welcome these two wonderful teachers to Nijmegen and look forward to meeting them again on a dance floor somewhere some time soon! It was such a pleasure to welcome Erik Linnartz and Birgit Pfalz here in Nijmegen, to show us some new moves and change the way we think about the dance. We worked on leading and following rock steps, one of the basic features of couples’ dancing that can always be improved, no matter how long you have been dancing. We then worked on dancing in a “smooth” way, letting every figure flow seamlessly into the next, so that the dance feels so much more relaxed: our ultimate goal! Thanks Erik and Birgit, you made a huge difference to all of our dancing! Our favourite big band the Kalishnikovs were here again in Nijmegen as part of the city’s Kunstnacht festival. We had huge group of Nijmegen dancers as well as plenty of lovely visitors from out of town. We swung out hard for two hours to their live music, accompanied by DJ sets from our very own DJ Mathias! Thanks K’s, we love you! Kate and Pieter Aart: take two! Kate and Pieter Aart were back in Nijmegen and we all had a blast! We learned how to dance fast Charleston without breaking a sweat, as well as breaking down our dance moves into simple blocks, so that both partners can enjoy their dancing without any stress.This was followed by our regular Sunday Tea Dance at Brebl, where we were all able to try out our new moves and technique. Kate and Pieter Aart will be back soon, for sure! Swinging out with Rob and Diane! On Sunday 2nd August Rob and Diane van Haaren were in town to show us a thing or two! Rob grew up in Nijmegen, although he moved to California 30 years ago to pursue his dreams, where he discovered the Lindy Hop and, through it, his wife Diane. It was a pleasure to welcome Rob “home” and to meet his lovely family. Rob and Diane started to Lindy Hop in California, where they learned the original Frankie Manning and Al Minns style of Lindy Hop. Since then they have been dancing and teaching all over the world, including at Herräng Dance Camp in Sweden for over 18 years. They came to us to share their energy, technique, musicality and their Lindy Hop philosophy and we were not left disappointed! Class 2 – Suzie Q! We had two 90 minute classes, the first of which focused on keeping momentum and flow in the dance. Everyone’s swing out was dramatically improved in this short space of time and we learned how to apply the same techniques and ideas to our movements in many other aspects of our dancing. The second class stressed the role of authentic solo jazz steps in our partnered dancing, how to play and have a conversation with our partner, whilst maintaining the basic concepts of “lead” and “follow”. We were very happy to welcome many dancers from out-of-town, including one dancer all the way from Norway! We finished the day with an energetic after-party where everyone was throwing down their new moves and improvisations. Rob and Diane, please come back soon! We’ve got an exciting programme of workshops coming up for you this autumn! On the weekend of 19th-20th September we’re delighted to welcome back our beloved Pieter Aart Schouten and Katelyn Price for round two. We all learned so very much from them last time, we just had to invite them back. It’s going to be great! Then on the weekend of 28th-29th November we can’t wait to learn from Kenny Nelson and Jesse Hanus. You’ve watched their youtube videos to death: now it’s time to learn from them in person! More information to follow soon. Lindy What? Nijmegen First Anniversary – what a weekend! Our “Lindy One” anniversary weekend exceeded all of our wildest expectations! Thank you to everyone who took part, be it in the workshops, the parties or the organisation: it was a blast! 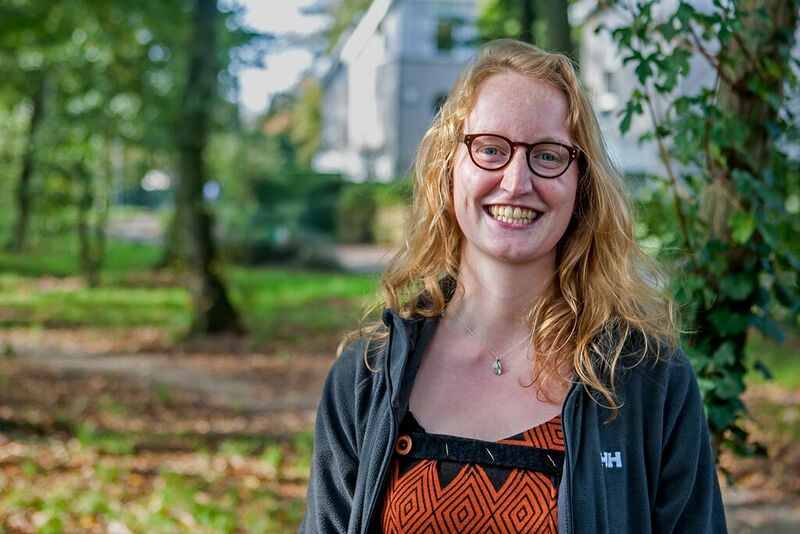 The main focus was of course the two-day workshop with Katelyn Price and Pieter Aart Schouten. It seems that all of our dancers picked up new ways of approaching their dancing: if you can be responsible for your own bounce and rhythm, without relying on your partner to give it to you, then you have so much more freedom to add your own variations and expression. Lindy Hop is about teamwork: you dance together as a pair but with the freedom to add something of yourself in every dance. Pieter Aart and Kate made everything so much fun, challenging us to break out of our established patterns and find something new. In between the two workshop days was a simply amazing party in the Kolpinghuis in Nijmegen, with live music from our dear Kalishnikovs! Thanks everyone for the Nijmegen birthday jam! We can’t wait to welcome them back in the near future. We finished the weekend with a lovely, cosy after-party at Thiemeloods in Bottendaal. It’s like we’re a family already! Watch this space for news of our next workshop weekend! In February our dance club will become one year old. It’s amazing to think back to that crazy first night in Café Trianon and to see how far we have all come since then! Not just in terms of our numbers but also how much progress everyone has made in their dancing. Friday 27th February Learn the Shim Sham! Through these links you’ll hopefully find all of the information you need (we’ll keep adding to those pages, so please keep checking back). We also look forward to welcoming all of you from out of town, especially those who have been supporting us over the last year, we couldn’t have done it without you! The Kalishnikovs live @ Brebl! The Kalishnikovs are coming to Nijmegen! 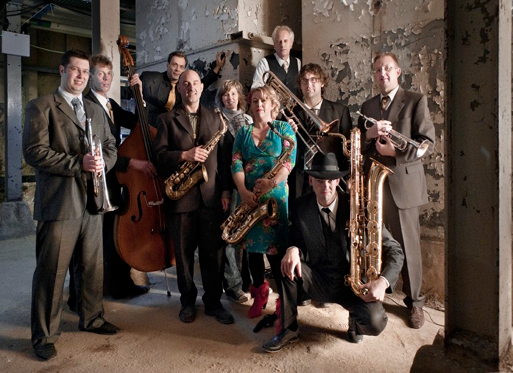 Eindhoven’s `house band’ are coming to swing the joint, you really don’t want to miss this one! Back in the 1930s Big Band Era they didn’t have DJs: it’s time for us to enjoy that buzz that comes from dancing the Lindy Hop to live music. Workshop with Robert and Chantal from Eindhoven! Here’s some preliminary information for you all to mark in your diaries. 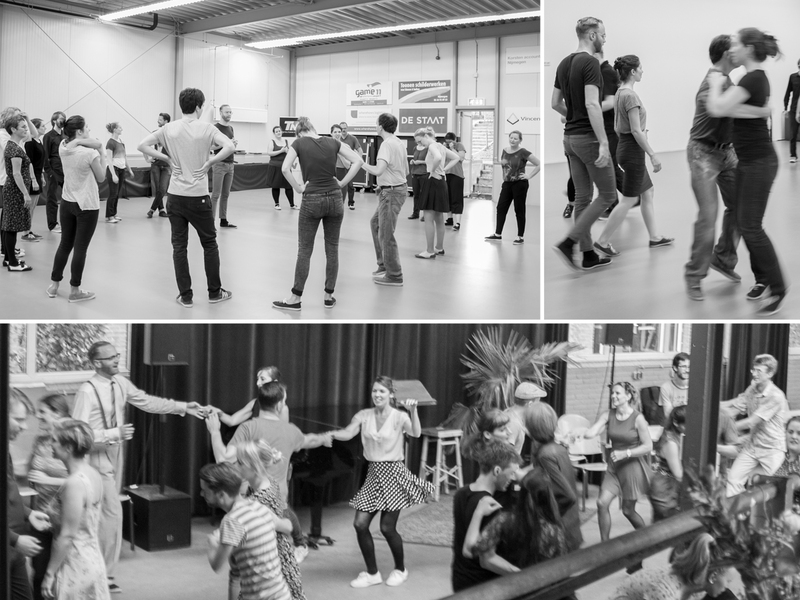 The weekend of 10/11 October 2014 will be a big weekend of Lindy Hop in Nijmegen! On Friday 10th we will dance to live music from The Kalishnikovs. 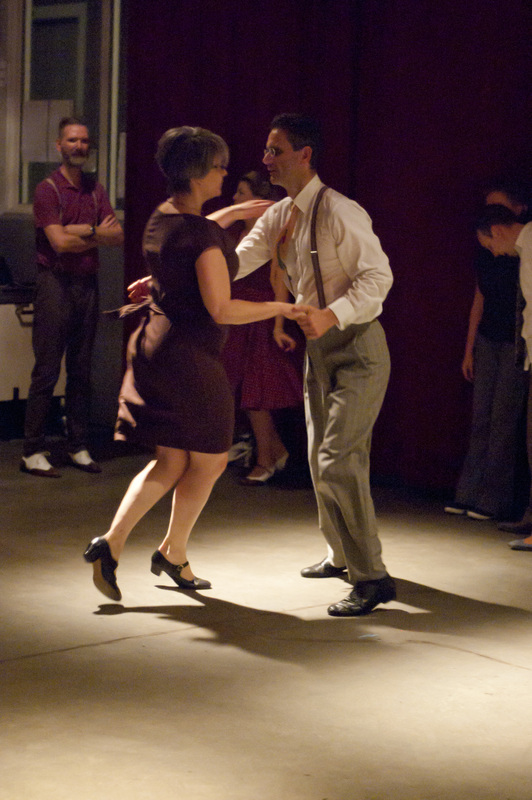 On Saturday 11th we will have a Lindy Hop workshop with Robert and Chantal from Eindhoven. More information to follow very soon! The summer is over, we hope you are all well rested because it’s time to start dancing again! 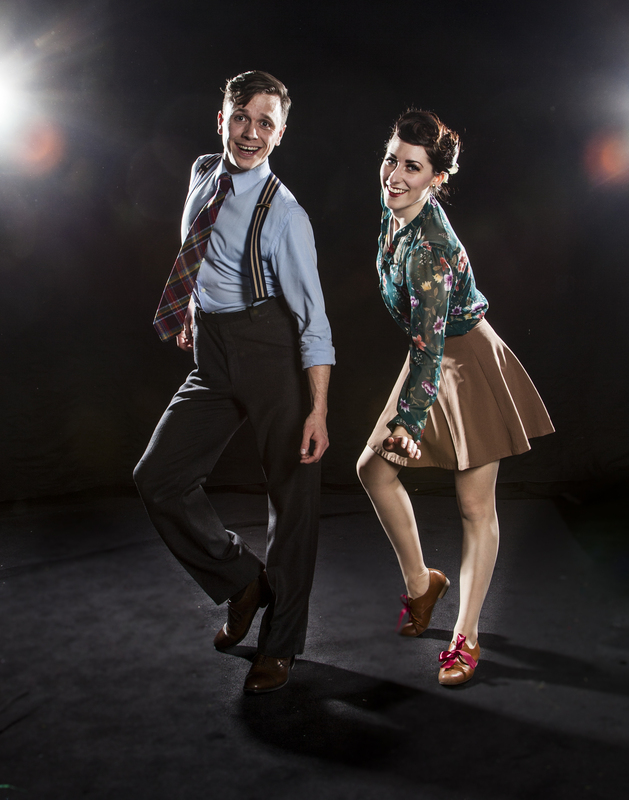 On Saturday 30th August there will be an intensive Lindy Hop workshop for beginners with Inge and Simon. Our next block of classes is almost full, so if you want to get going with your Lindy Hop and then come dancing with us at our upcoming social events, then this is your chance: don’t miss it! Everybody listens carefully to the Lindy Hop wisdom. 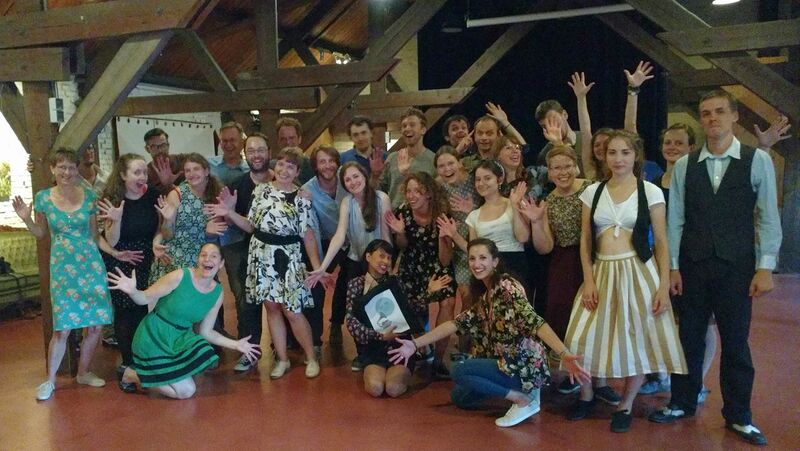 On Saturday 21st June we had our very first Lindy Hop workshop here in Nijmegen: it was really a pleasure for us to welcome Praveen and Dolinde from Amsterdam! Dolinde’s smile says it all! These two very experienced dancers and energetic teachers put us through our paces, ranging from some rhythm exercises to help us get a better feeling for the music to some crazy Charleston steps and variations. However, the highlights of this three hour extravaganza were without doubt their Sailor Step variations, which proved extremely popular with everybody and are now quite a common sight on the Nijmegen social floor! Thanks Praveen and Dolinde for the energy and fun that you brought to Nijmegen! Thanks also for your kind words about how well everyone is dancing in our new scene. We can’t wait for you to come back! As organizers, we would like to thank all of the participants for their hard work and enthusiasm: it was hot, it was sweaty and it was sometimes tiring but, as always, you all totally rocked it! Greetings from Herräng Dance Camp! After a few weeks’ holiday, the website is back! Sorry for the absence although, as we’re sure you can imagine, it was all in the name of Lindy Hop! 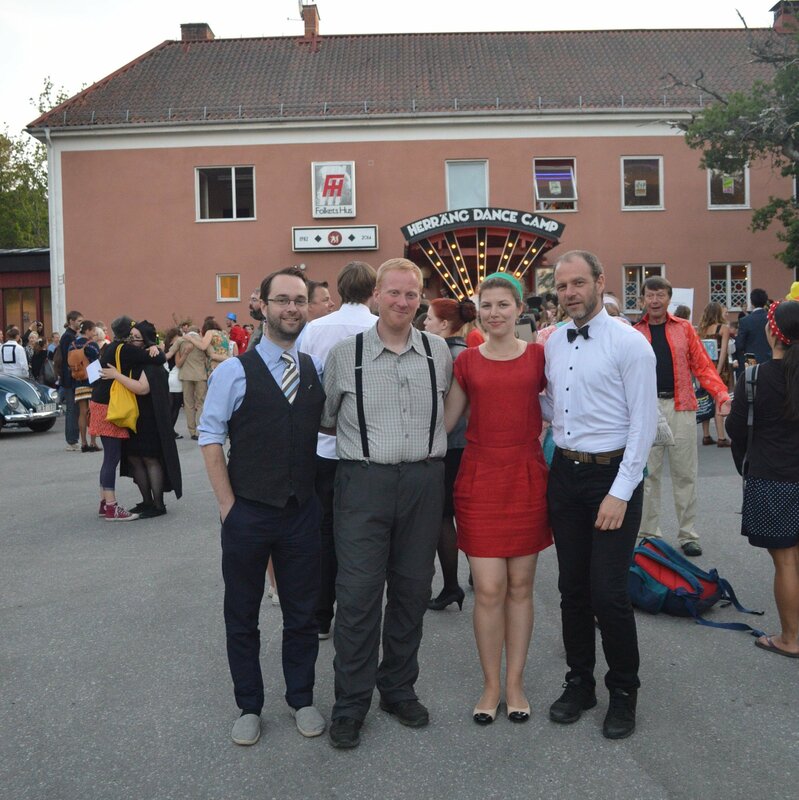 In particular, Simon spent a week at the Lindy Hop dance camp which happens every year in the tiny little village of Herräng, an hour or so north of Stockholm, in Sweden. Due to various life coincidences, Herräng became the focal point of the Swedish part of the worldwide Lindy Hop revival in the early 1980s. Now itself over 30 years old, the Herräng Dance Camp has grown into an annual festival attended during its five week duration by hundreds and hundreds of dancers from all over the world. Going there is surely the ultimate rite of passage for any self-respecting Lindy Hopper. With such glorious sunny weather, wonderful food and three hours of dance classes every day, followed by hours and hours of social dancing in the evening (you can dance until breakfast if you want to), this is a Lindy Hopper’s Heaven-on-Earth! Now back in Nijmegen, Simon is full of all sorts of new moves and ideas to show you! Are you ready? Tack så mycket, Herräng, vi ses nästa år! Next Lindy Hop party in Nijmegen! We “hopped on the boat” for Frankie’s birthday! On Tuesday 27th May the second Hop on the Boat took place on the Nijmeegse Boot, this time to celebrate what would have been Frankie Manning’s 100th birthday. Starting as usual with a taster class for beginners, we danced the swingin’ night away.The evening had it all: bounce, swing, smiles and laughter, a shim sham and even a birthday swing jam! Thanks to everyone who came, especially to our dancing friends from out-of-town. Don’t just take our word for it, check out the video below. Happy birthday Frankie! 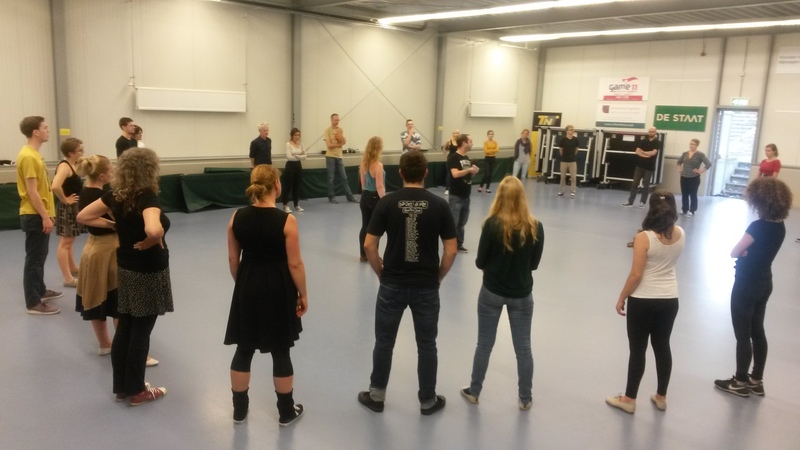 Workshop in Nijmegen with Praveen and Dolinde from Amsterdam plus Workshop for Lindy Beginners! 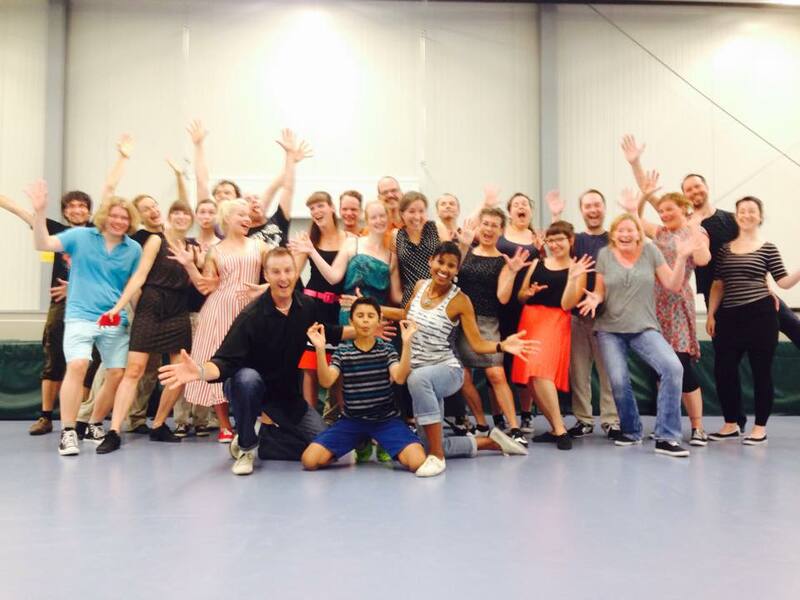 We are excited to welcome Praveen and Dolinde to teach our first big Lindy Hop workshop here in Nijmegen! In the afternoon of Saturday 21st June they will help us to improve our dancing technique and show us all sorts of cool new moves! Don’t miss out!The workshop with Praveen and Dolinde is intended for dancers who already have some experience of dancing the Lindy Hop. For those of you who have been trying to register for our beginner courses but without success, there will instead be a beginner workshop especially for you! It will take place in the morning of Saturday 21st June, taught by our very own Rosalind and Simon. 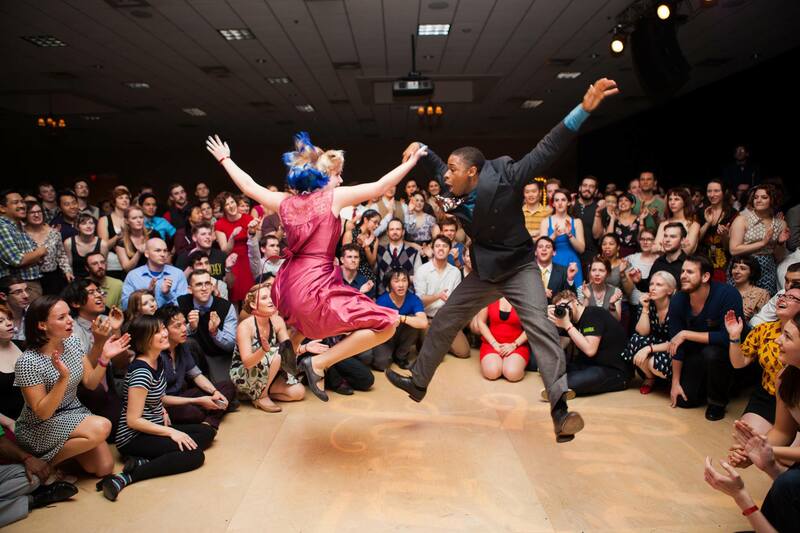 Here is your chance to get going with your Lindy Hop, so don’t miss it! In January 2014 there were just six Lindy Hoppers in Nijmegen. Just a few months later, look at us now! 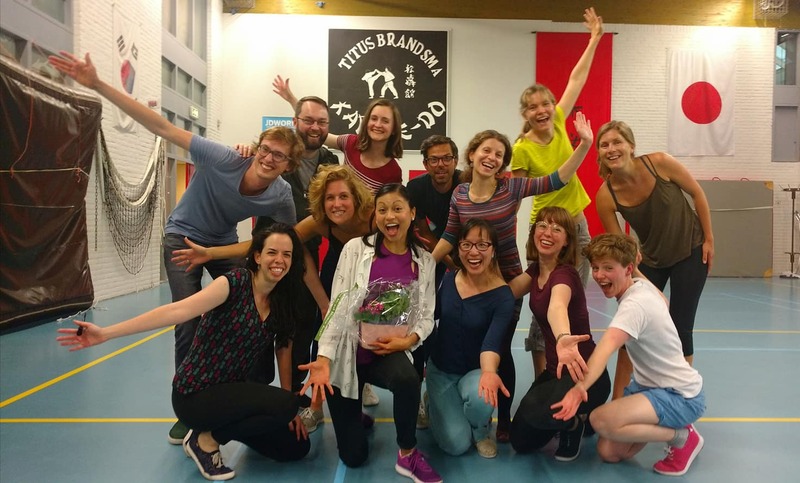 Nijmeegse Lindy Hoppers, you have made our dream come true: we hope you are having as much fun as we are, none of this would be possible without your amazing enthusiasm! Class registration is now closed for the time being. All of our current Lindy Hop courses are now full and registration is unfortunately no longer possible. Stay tuned for details of our next set of classes. In the meantime, you can come along to one of our drop-in classes, the next one being on Tuesday 27th May at Hop on the Boat for Frankie! Hop on the Boat was a huge success! 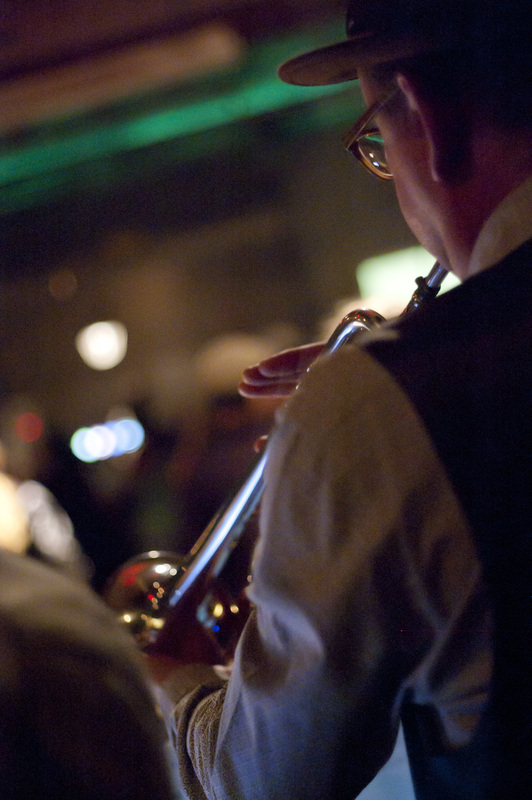 to the best of swing music both old and new, courtesy of DJ Mathias. We were ecstatic to see how well everyone is dancing after just a few lessons and it was again a pleasure to welcome our dancing friends from out-of-town. Stay tuned for details of the next one, it’s coming soon! Our next course for Lindy Hop beginners starts on Friday 9th May! Lindy Hop level 2 (for those of you who already started our classes) begins again on 25th April. Check out our schedules and pricing and details about how to register. They will fill up quickly, so don’t be late! Unfortunately, registration for Lindy 1 is now closed to followers; we can now only accept registrations from leaders registering alone. Friday 21st March saw the very first lesson of the very first course for Lindy Hop beginners in Nijmegen, taught by Inge and Simon. Thank you everybody for making it such an enjoyable experience, we hope you all had as much fun as we did! With your amazing energy, your relaxed attitude and your hunger to learn, you totally rocked every move we showed. We’ll see you next week for more of the same, we really can’t wait to dance with you again and show you some more cool moves! In the meantime, keep on swingin’. Beginners’ course is now full! 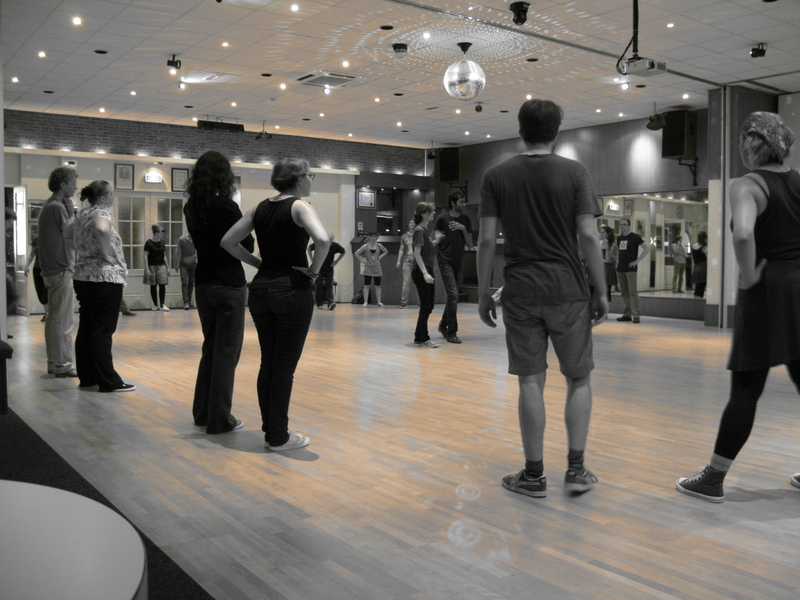 Our first course for Lindy Hop beginners is now full. Were you planning on registering for the course but now you’ve missed out? Don’t worry: there will be another course starting in early May. In the meantime, you are of course always welcome at the social dancing every Friday after the class! On Friday 7th March the Meschiya Lake Quartet was in town. They brought their unique brand of New Orleans swing to Nijmegen as part of their tour of the Netherlands this month. We at Lindy What? rarely miss a chance to dance to live music and so, together with some of our lovely dancing friends from Eindhoven, you might have seen us swinging out hard at the back of the venue! It was so cool to have some of our newer dancers come along and join in the fun: together this is how we build a scene. We’ll keep you posted about future opportunities! Lindy What? Nijmegen Launch Party: what a night! The Lindy What? launch party was a huge success! We kicked off the evening with an introductory lesson for complete beginners with Rosalind and Simon: the room was completely packed, way beyond all of our initial hopes and expectations. At one point we counted 90 people on the dance floor! This was followed by another three hours of swingin’ social dancing to music ranging from the classic swing jazz era to the modern, courtesy of DJ Mathias. The atmosphere was electric and it was pure joy to see the dance floor “bouncing” in unison. Well done Inge for finding such a cool venue! In Lindy Hop we measure success by the size of the smiles on people’s faces and in this way we couldn’t have had a better start: thank you everybody for all your support. The spirit of Frankie Manning is alive and well in the Netherlands and now it has arrived in Nijmegen too! Registration has opened for our first series of Lindy Hop classes for beginners, which will take place at Danstheater impro vi. The course will begin on Friday 21 March and continue for five weeks every Friday until the Easter break on Friday 18th April. Each class will start at 20.00 and last for one hour, followed by an hour of social dancing until 22.00. 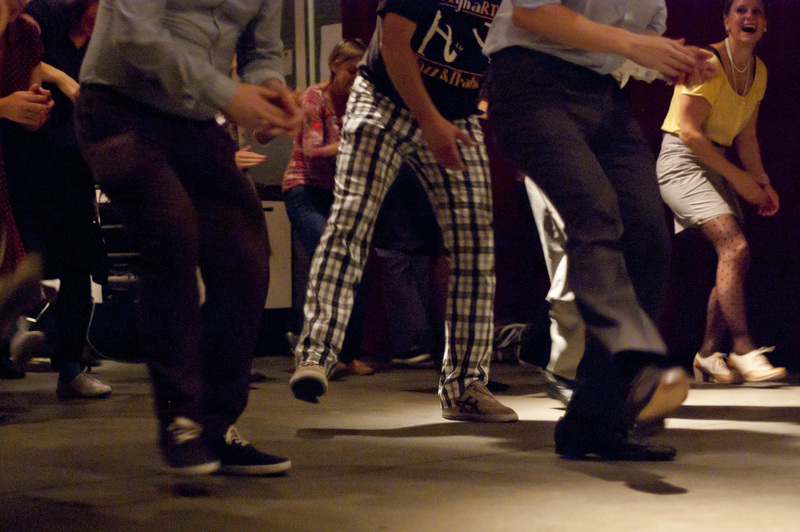 On Friday 28th February and Thursday 13th March we will have two more evenings of Lindy Hop at Café Restaurant Trianon. We begin on both evenings at 20.00 with a one-hour drop-in class for absolute beginners with Rosalind and Simon, followed by social dancing until 22.00. 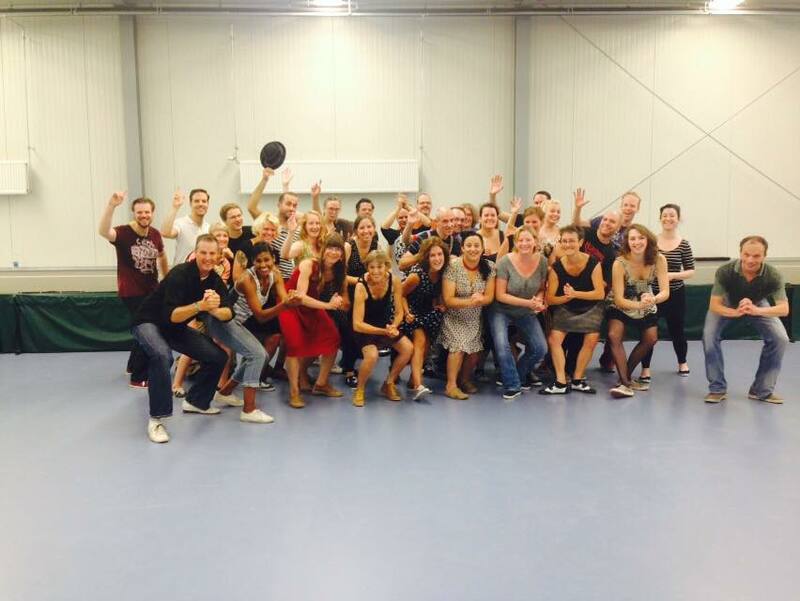 Come and celebrate with us our first night of Lindy Hop here in Nijmegen! We’re organizing a swing dance party on Friday 21st February 21.00 onwards at Café Restaurant Trianon. We’ll kick off with an introductory lesson for complete beginners with Rosalind and Simon, then we’ll dance the night away to the best of swing music from DJs Mathias and Simon, all of this for free!